This is the cracker that got a rise out of Venus and brought her out of her shell. A subtle, savory blend of garden herbs and garlic with a flirty hint of tomato. All wrapped up in a crunch that’s the perfect pedestal for everything from your favourite artisan cheeses to your most sophisticated hors-d’oeuvres. Or you can munch away just as the goddess of love intended: straight out of the box with nothing but a smile. Light and flaky gluten free crackers, flavoured with tomato and oregano. 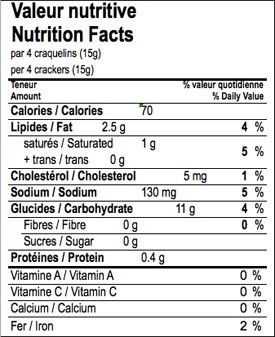 Ingredients: Corn starch, white rice flour, organic palm oil, modified corn starch, dextrose, liquid whole egg, yeast, tomato, powder, salt, oregano, garlic, guar gum, ammonium bicarbonate, sodium bicarbonate, mono and diglycerides, flavour. Contains eggs. May contain traces of soy, milk, and sesame. These are okay, I found them to be too spicy for vegie crackers. Surprisingly good. 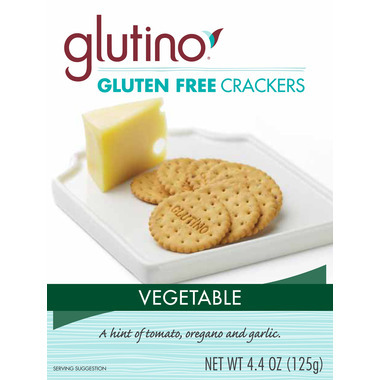 They taste a lot like Ritz crackers without the gluten. These are just too good. Crunchy, flavourful and hard to stop at one or two. Expensive, but wirth the money. Too much spice and flavours, and does not have a full rich taste. It is taking me a while to finish one of two of the packs.